Groups: the app starts up with the group list view. You can add (+ button), delete (swipe on group name), rename (tap on blue circled arrow), and reorder (Edit button) groups. Sort order of a list within a group can be changed in where you change group name. Tap on a group name to see the list of stations. 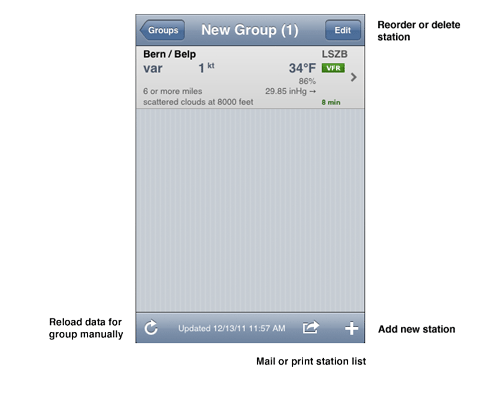 Stations list: within a group you can add (+ button), delete (swipe on station), and reorder (Edit button) stations. Tap on a station to see its detail view. 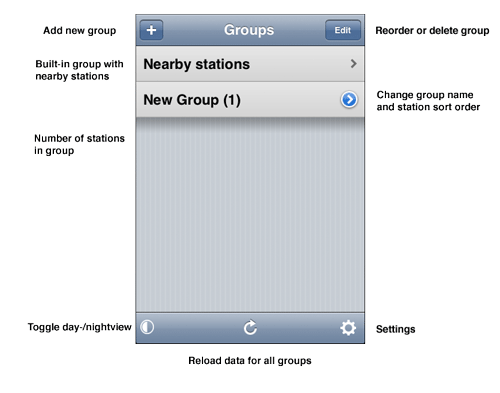 Station list: you can add (+ button), delete (swipe on station), and reorder (Edit button) stations. Sort order of the list can be changed in settings. Tap on a station to see its detail view. Loading data: there are two ways to load data: 1) go to settings and switch “auto load” on. Data will be loaded automatically as you navigation in the app; 2) tap on the reload button in station list view to load manually for the list. Auto-Loading fetches data whenever the app or a group is open (if last loading is older than 3 minutes). Auto-Loading will be switched off when the app crashes in order to prevent a indefinite startup loop. You can switch it on again anytime. App in English changes the app to English language (and disregards your devices language setting). You have to kill the app and start it again to be in effect. Backup & Restore offer two ways to save your data (groups, notes). You can backup your data to e-mail and use that e-mail to do a restore (on any device with AeroWeather Pro). You can also use Dropbox to save and restore your data. Mails as well as files on Dropbox can be shared. Overview list lets you cange the some display options (raw or decoded METAR, ICAO and/or IATA identifier, relative humidity and/or pressure) in the station list. Units lets you set your preferred units. Reset stations removes all stations, groups and notes from your lists. Local times converts all times in the app into the local time of the station. If switched off, UTC will be used instead. Civil twilight adds dawn and dusk to sunrise and sunset (when sun is 6° below the horizon) next to the station name on detail view. Moon data will show time of moon set and rise plus phase. Calculations shows pressure altitude, density altitude, and freezing level (using ISA model) below METAR section in detail view. Based on formula by NWS El Paso. Runway data adds a section in detail view with a list of runways. If available, wind components (head, tail, and crosswind) will be calculated based on the latest METAR. The calculations include magnetic variation (if available) as displayed right below runways. Use gust factor uses gusts for calculations of runway wind components (if gusts are not reported in the latest METAR, normal wind speed will be used). Radar loops loads up to 8 images to show animated radar data (available for US and Canada only). When switched off, only the latest radar image will be loaded (this might save some bandwidth when used abroad). 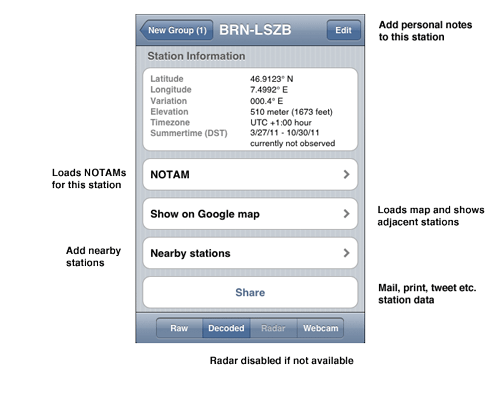 Flight Rules lets you choose the system to be applied (ICAO or US NOAA) for showing flight rules. Wind Director Indicator lets you choose the direction of the red wind pointer in the list view (decoded mode only).